Tibby, Lena, Carmen, and Bridget have grown up, starting their lives on their own. And though the jeans they shared are long gone, the sisterhood is everlasting. From the reviews I’ve read I was expecting the bittersweet conclusion of my favourite childhood series to be completely horrific but to my surprise I quite enjoyed it. That doesn’t mean Sisterhood Everlasting wasn’t like a dagger to the heart and it definitely wasn’t a return to the close knit group of friends I once loved. It was painful, heart wrenching, frustrating and at times, hopeless. The book begins with a grim tone as the sisterhood are separated and the girls are struggling with the realities of adulthood, until a reunion is planned setting in motion a mind shattering and tragic event. Much of the book explores how the characters respond to this tragedy and the book becomes infinitely more heavy and depressing. Like the characters in the book, I was left confused, hurt and questioning the motivation behind the author’s decisions. Once the initial shock wore off, I felt myself being wrapped in Ann Brashares’ words, they’re kind and raw and comforting. They’re the kind of words you want to hold on to and get lost in. Bee, Tibby, Carmen and Lena are all very flawed characters. Even when I was annoyed and frustrated with them, I just wanted to hug them. Their love, loyalty and strength of friendship are easy to identify with, these are the reasons why I enjoyed this book so much. The plot is character driven, it is a story about love, loss and finding your way. It’s the coming of age of people in their late 20’s. Some of the turning points in the book felt too well constructed and at times unbelievable and three quarters in I was starting to get tired with the slow plot progression. The ending, although bittersweet, felt completely satisfying. Overall, I really enjoyed revisiting the group of friends my childhood self aspired to be like. 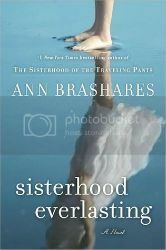 I loved the way Ann Brashares described each of her characters’ emotions even if I didn’t always agree with the direction of the plot. Fans of this series should definitely go into this conclusion with caution and be prepared for an unhappy but hopeful book. If you haven’t read this series, it’s a great summer read and I highly recommend it.